Business to business sales are always challenging. 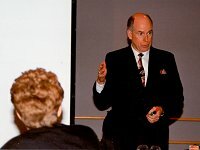 It is my hope that this location will provide some insights that are helpful to increase selling skills for you and me. This has been set up to allow visitors to present or ask "Sales or Marketing" questions and for me and others to provide comments. Our sales people are scattered around the country. If would be expensive to get them all together for training. Do you provide your courses online? From John: Thank you for taking the time to post your question. We have just completed an exhaustive study of the various Online Training Alternatives which I could email to you at No Charge. Just send an email to me at john@mitchellsell.com or click on the "Envelope" icon above next to harleyguy (me). We do offer Online training programs and have some examples on our web site www.mitchellsell.com under the "Online Training" link. We do not offer our standard courses online at this time but you can get our books and tapes or CD's by ordering them from our web site using PayPal. Our courses are two-day programs. Please feel free to call me for further discussion on my cell phone at 248-361-7911 or by posting more questions here. I had a long career with the General Electric Company and started Mitchell Selling Dynamics, Inc. in 1990. We are a high-tech sales and marketing solutions company located near Detroit, Michigan.